Concealed in the woods on Shooters Hill is a building with a peculiar past and a brighter future. 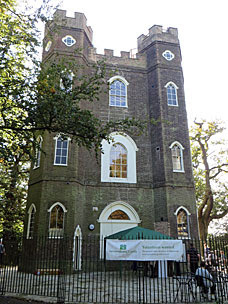 It's a 60 foot brick tower called Severndroog Castle, built by a grieving wife to commemorate her husband's military exploits, and not so much a castle as a widow's folly. Given its height and location it's incredibly well hidden, revealed only when you're right up close (or, in winter, from slightly further away). The building has an approximately triangular footprint, consisting of one central hexagonal tower with three smaller hexagonal towers on alternate sides. Sorry, that's probably over-explaining it. Severndroog Castle honours Sir William James, one time Commodore in the East India company, who died suddenly at his daughter's wedding in 1783. His greatest maritime success had been to capture a fort off the coast of Malabar by the name of Severndroog, hence this was the title Lady James gave to the folly she had built in his honour. Sorry, that's probably under-explaining it - the full story has rather more to it - but I don't want to tell you everything you'll discover if you turn up. The tower passed into the hands of various owners before ending up in the care of the GLC, then Greenwich council who planned to lease it to developers. Stuff that, thought a bunch of interested citizens, who promptly set up a Building Preservation Trust and raised the money to take over the lease. Their efforts and a half million pound lottery grant restored the fabric of the crumbling building, and earlier this summer they opened the place up to visitors for the first time in years. It was great to be back. And very popular too. Perhaps it was Sunday's splendid weather, but quite a crowd had mustered around the foot of the tower, plenty enough to justify the tower's rebirth. One reason for the swarm was the tearoom located on the ground floor of the tower, spilling out onto sun-dappled tables in the courtyard. But the main reason was the 40 minute wait to go up the tower, which meant there was a pressing opportunity to visit the tearoom in the meantime. On busy days the tower has to operate strict timed entry because only ten visitors are allowed on the upper platform at any one time. Admission into the building comes ten minutes earlier, allowing about five minutes on each of the two floors stacked above the tearoom (plus longer if you want to look again on the way down). The first floor contains the Lady James Room, an impressive chamber with painted ceiling and central brass light fitting (although LJ's original plaster designs are alas mostly lost). Then it's up the spiral staircase for a plainer room named after her husband, this filled with historical and heritage information, plus to one side an unexpected pair of toilets. But it's the roof you'll really want to see, assuming it's a fine day, and quite frankly you should wait until it is. Initially it seems as if you'll only see treetops, but another set of stairs leads up onto the top of a satellite tower... and from here, suddenly, wow. 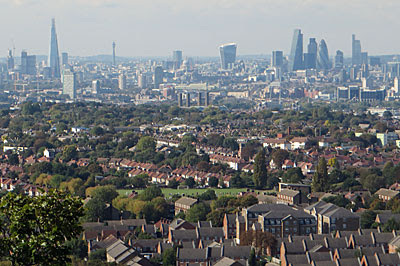 The treeline means it's not a 360° panorama, more like two hundred and a bit, but the visible sector faces the City and the East End and opens out to reveal the majority of London spread out below. It's the tall towers that draw the eye, but in good visibility the hills of Harrow and masts of Croydon are clearly seen, and Wembley's arch, and the Olympic Stadium, and Dartford Mental Hospital, and that must be somewhere in Barking, etc etc. The allotted ten minutes simply fly by, especially if you've spent most of the time taking photos and selfies. But how much better to simply stare and absorb the vast low-rise glory of the capital, before the kitchen pinger rings and the rooftop volunteer ushers you back down. The trust are looking for more volunteers, by the way, because they currently only open on Thursdays, Fridays and Sundays and would quite like to add Saturdays too, but only if they get more help. The £2.50 entrance charge only goes so far, so donations of small change and time are always very welcome. And what of the tearoom? It's compact and cakey, with a menu ranging from frothy drinks to jammy toast. I plumped for tea and a panini, the latter properly baked and served up with coleslaw on a wooden platter. The sandwiches looked less special, and the service could perhaps best be described as bustlingly inefficient, although I'm willing to put that down to sheer numbers of orders. If you do pause here while waiting your turn up the tower, don't necessarily assume that your order will be ready in thirty minutes. 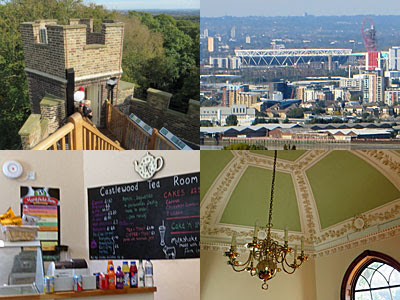 But do come, because Severndroog's combination of heritage, rooftop views and cake are a definite winner, if you pick your time right.